Older collectors of semi-automatic pistols have certainly heard of Interarms and perhaps of its colorful owner, Samuel Cummings. Most of us certainly own pistols that once passed through his large warehouse complex in Virginia or at the very least, remember his many interesting advertisements and catalogs from the golden days of the military surplus world. This short article will describe Cummings and his background, as well as his company and the influence it had on our collecting world. Samuel Cummings was born in Philadelphia in 1927 to wealthy British parents. His father lost a family fortune in mineral water when the US stock market crashed in 1929. He died at age 47 when Samuel was eight and his mother later became a very successful real estate agent in Washington, DC. Sam collected his first gun as a five year old boy. He found an old German Maxim machine gun in the garbage outside an American Legion post and carried it home in his little red wagon. He was drafted right after World War Two and served in the US Army as an infantry sergeant and gun instructor at Fort Lee, Virginia. After discharge he graduated from George Washington University on the GI Bill and briefly attended Oxford. He joined the new Central Intelligence Agency in 1950 as a weapons expert identifying small arms obtained in Korea and he learned the arms trade with them over a period of four years. According to his obituary, he first masqueraded as a Hollywood producer buying guns for his movies while obtaining $100 million worth of cheap German military surplus arms in Europe to sell to the Chinese Nationals. Figuring he could do much of the same on his own, he left the CIA in 1953 and started his own business, International Arms Corporation or Interarmco, in Alexandria, Virginia. The world was flooded with arms after World War Two and the charismatic Cummings used his CIA contacts and arms expertise to build up huge stockpiles and began to sell them to individuals and governments everywhere. His sister married an United States senator from Texas, John Tower which helped to improve his contacts. Through his friends he was awarded contracts to arm the allies of the Americans and British. He didn't downplay his CIA ties, he named one of his companies Cummings Investment Associates. He sold arms to anyone he could legally sell them to with only a few exceptions. Among his customers were the right-wing Cuban dictator Fulgencio Batista, and the Communist Fidel Castro. In addition to selling to the citizens of the US and Britain, and the clients of their governments, nations such as Singapore, the Philippines, Israel, Malaysia, France, Austria, and countless entities in Latin America and the Middle East were customers. The only people he refused to do business with was Muammar el-Quddafi and Ugandan leader Idi Amin. His biggest arms deals were from Spain. He bought the entire surplus from the Spanish Civil War in the course of two purchases in 1959-60 and 1965-66, amounting to one million weapons and 250 million rounds of ammunition. Cummings became the export sales agent for many small arms manufacturers, including ArmaLite. He peddled the AR-10 and sold the Nicaraguans on it in 1957. He sold 100 to Batista in 1958 but Castro's forces captured the shipment in Havana the next year. Cummings wrote to Castro and asked him to either pay for the rifles or return them and was invited to visit Cuba. Castro ended up paying for the rifles and wanted more but Cummings couldn't oblige due to the American Arms Embargo. In addition to small arms, he peddled tanks, artillery, and jet aircraft. 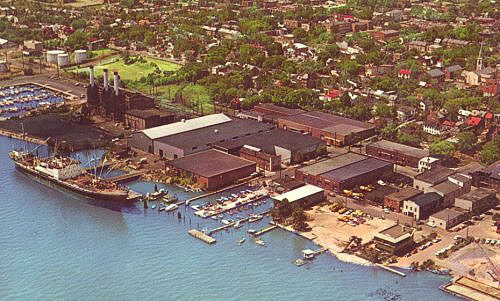 Interarms dock and warehouses, Port of Alexandria, Virginia circa 1963. The square building with the brown two tone roof on the bottom right hand corner of the image was Potomac Arms. Founded by an Interarms employee, it was an area favorite. From: The Lore of Guns website. In 1966 Cummings and his company were sued by Armo Steel Corporation for trademark infringement. They lost the civil suit and had to change the name of the company to Interarms. In a 1970 article with Sports Illustrated, he made a few interesting comments. He mentioned that the 1968 Gun Control Act wasn't really all about gun control but included an economic measure to stop surplus weapons, but that it was already basically too late. He said the rifle makers of New England didn't get that his customers usually started with a cheap military surplus rifle and then moved up to a nice Winchester or Springfield rifle. He thought that his surplus business would have dried up by 1975 anyhow based on his available sources of WWI and WWII bolt action rifles and that he already couldn't sell the newer automatic rifles. (The stockpiles of Russian weapons, which he estimated at 25 million, were his focus near the end of his life as he related to a reporter in a 1996 newspaper article.) He also spoke poorly of the M-16 and said the Kalashnikov was a substantial weapon with a chrome plated barrel that didn't need cleaning and would not wear out. The M-16 looked like something bought in a toy store. He thought the US should make their own Kalashnikovs but chambered for a round one mm longer, that way they could also use enemy ammo but they couldn't use ours! He also thought the best military handgun since 1936 was the Walther P-38. Although Interarms was headquartered in Virginia, he rarely visited in his later years. He bought a lavish horse farm estate, Ashland Farms, west of Washington, where his two daughters lived. He later maintained British citizenship and kept homes in the Swiss Alps and the tax haven of Monte Carlo. 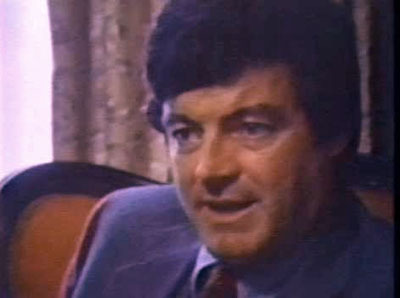 Cummings died on 29 April 1998 in his home in Monaco after a series of strokes. His family hid from him the fact that one of his daughters, who were fraternal twins, was facing a murder charge in Virginia after her polo player, Argentinean boyfriend was found murdered in the family mansion. She was eventually convicted of voluntary manslaughter and served 51 days in jail and fined $2,500. One would think certain things of one of the world's largest arms dealers, but Cummings was known as a genuine and honest man, one who followed the law and stayed on the good side of both the American and British governments, which licensed and approved of every single sale he ever made. Interarms was a giant in the business of surplus firearms in the heyday. In addition to the main offices in Virginia and Manchester, England, they had at times offices in Panama and Buenos Ares. Their house brands were Whitworth Rifle Company and Farquharson Rifle Company, both based in Manchester. The US distributor company was Hunters Lodge in Alexandria, Virginia. The Alexandria, Virginia complex had ten warehouses holding mostly high quality sporting rifles and pistols that were sold to American dealers and wholesalers. The British warehouse stocked primarily military weapons, which accounted for 70% of Interarms sales. 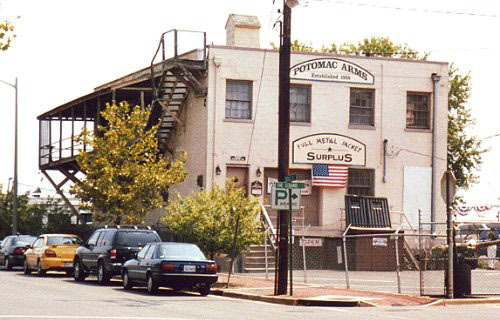 Potomac Arms was a major mail order retailer of firearms and ammunition obtained from Interarms and was owned by a former Interarms employee. It also housed for a time the retail outlet of Interarms, variously named "Ye Olde Hunter" and "Hunters Haven" on the first floor. Potomac Arms closed in 2006. From: The Lore of Guns website. Anticipating the 1968 GCA, Interarms went on a buying spree and had over 700,000 firearms in the warehouses when it went into effect. After surplus weapon imports were banned Interarms diversified . They were the franchise holder for Walther pistols in the US and they had a manufacturing plant in Gadsden, Alabama where they made 40,000 Walther PPK pistols annually in 1985. (The PPK can't be imported due to the 1968 GCA.) Interarms also operated an 115 person manufacturing plant in Midland, Virginia, making classic SSA pistols under the Virginian Dragoon label until it closed in 1985 after a downturn in international arms. A factory in England made their house brand line of fine expensive sporting weapons. 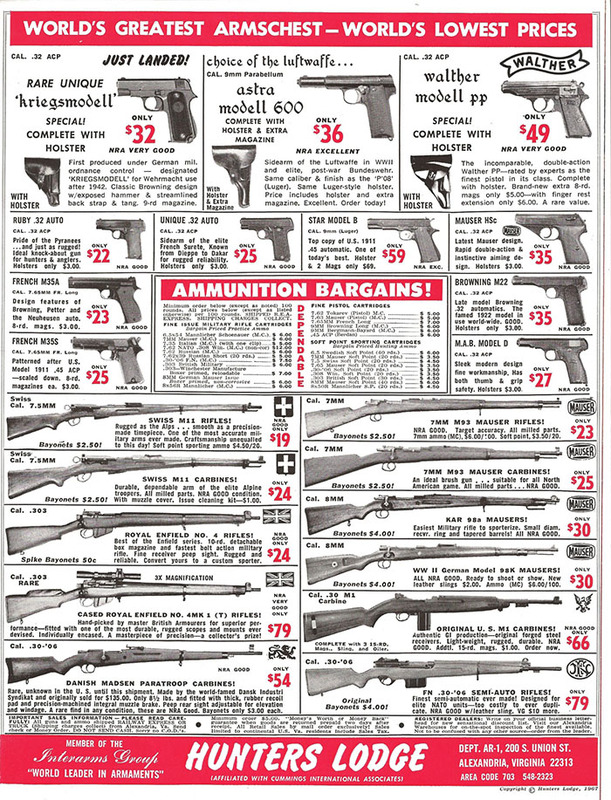 Interarms was also the primary distributor for Mauser, Rossi, Astra, and Star in the United States. In 1991 they imported new Helwan Brigadier 9 mm pistols. 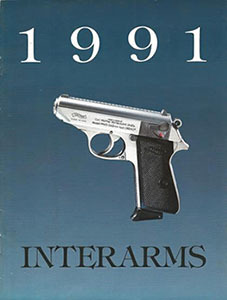 Interarms worked as early as 1970 with the Zastava Factory in Yugoslavia and in the 1991 catalog they were advertising sporting rifles with Zastava made actions. In fact it appears that the Manchester plant was shut down and the Interarms house brands were made by Zastava in later years. Norinco .22LR bolt action rifles were also imported in the early 1990s before Chinese imports were banned. When Sam Cummings died in 1998 he was the largest private arms dealer in the world with annual sales of $80 to $100 million dollars. His family had no desire to continue his work and the entire company was closed or sold off by 1999. After Interarms folded, Walther joined with Smith & Wesson in 1999 to make Walthers in the USA. Rossi formed Braztech International to import their firearms into North America. Mauser had gone under in 1995 and both Star and Astra went out of business in 1997. Back cover of the American Rifleman, January, 1968. Note the "Member of the Interarms Group" at bottom left. “Interarms and Potomac Arms in Alexandria,” from The Lore of Arms website. Washington Post, "Arms Dealer Cummings in Public Spotlight," Michael Isikoff , 22 Dec 1986. Deadly Business: Sam Cummings, Interarms, and the Arms Trade, by Patrick Brogan and Albert Zarca. W.W. Norton & Co., New York, London, 1983. The War Business: The International Trade in Armaments, by George Thayer. Simon & Schuster, New York, 1970. Copyright 2016 by Robert Adair. All rights reserved.